It doesn’t matter how many times I come around this same corner to this view, its always magnificent. 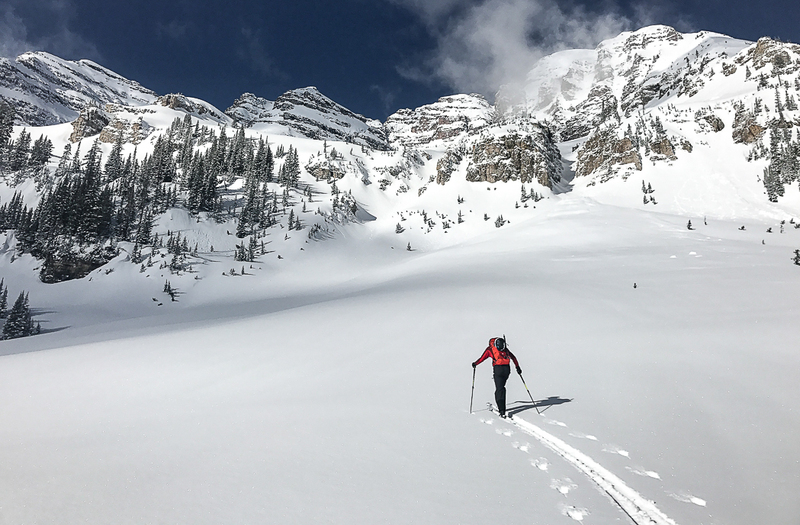 I think every backcountry skier out there has his or her mental list of lines that they see in their dreams and certainly chat with their buddies over at the bar. 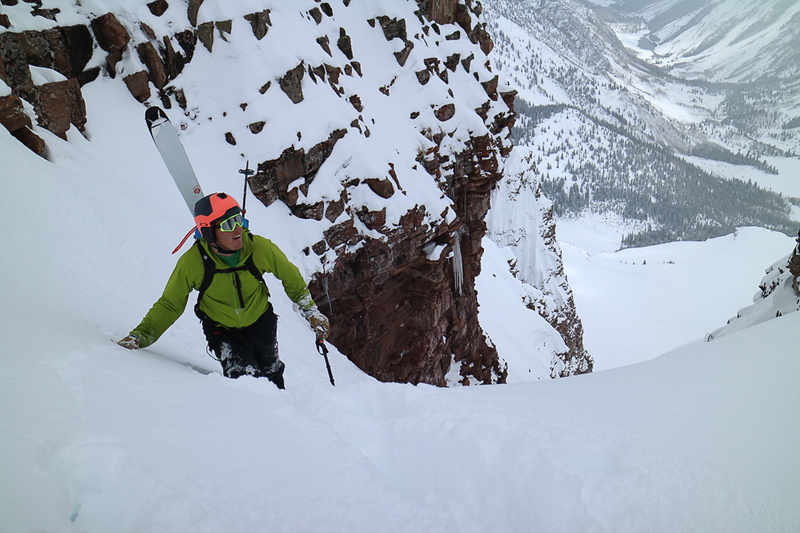 Last spring Anton Sponar, Mason Daly and I skied the north summit of the Sleeping Sexton (according to the map the south summit is the high point), we had a great day of skiing but I left with yet another line in mind for another day. We were breaking trail in Powder conditions right from the parking lot in cold crisp conditions. 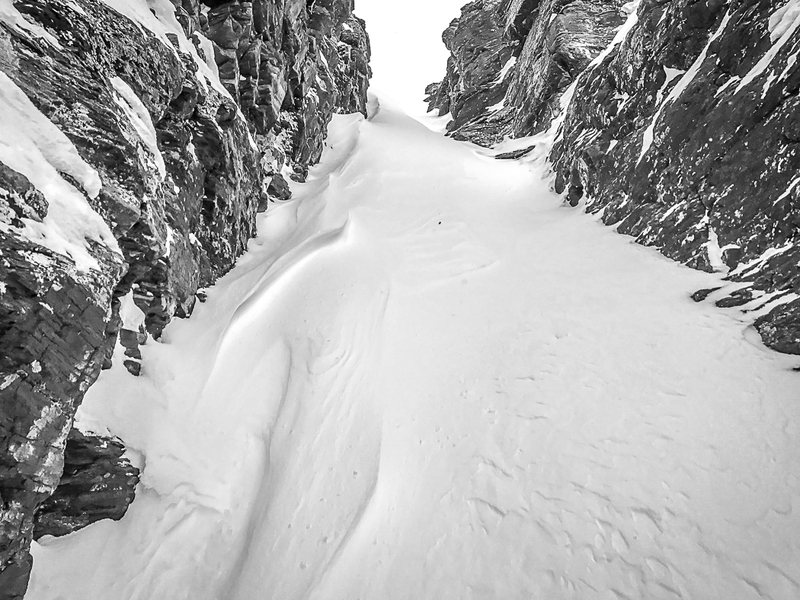 The south summit has a couloir that looks nearly vertical and almost impossibly skinny. 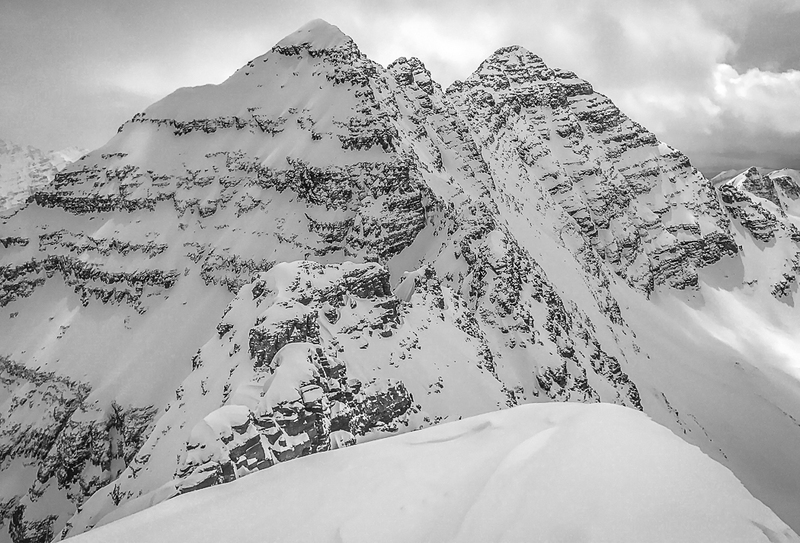 Anton and I had spent time talking about it more than once over the last year and given the forecast we decided big walls might be nice for visibility on Monday. We left T-Lazy 7 Ranch on sleds around 6:30 am and motored up the Maroon Creek road to the summer parking lot. Donning skins we were breaking shallow trail from the beginning with a nice 4 inches of fresh at Maroon Lake. The more than familiar summer trail passed quickly as we made the turn towards buckskin pass and ultimately we crossed the creek to head straight towards our destination. Our intended line is the skinny one on the left side of the face with an apron run out. A fresh canvas to draw on. 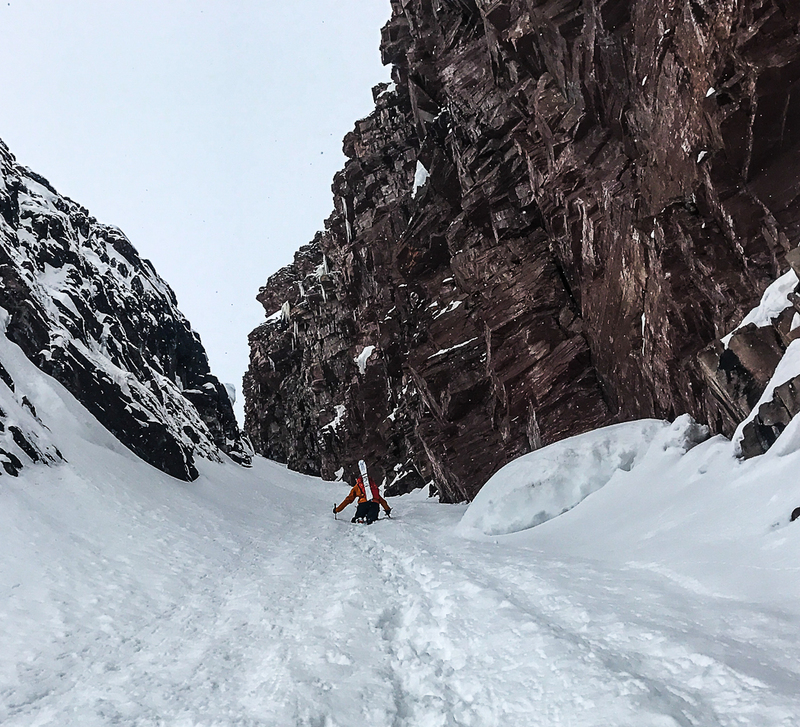 After crossing Minnehaha creek we managed to skin up the low couloir leading to the upper basin, albeit with a stupid amount of mini switchbacks while sweating under the spring sun. 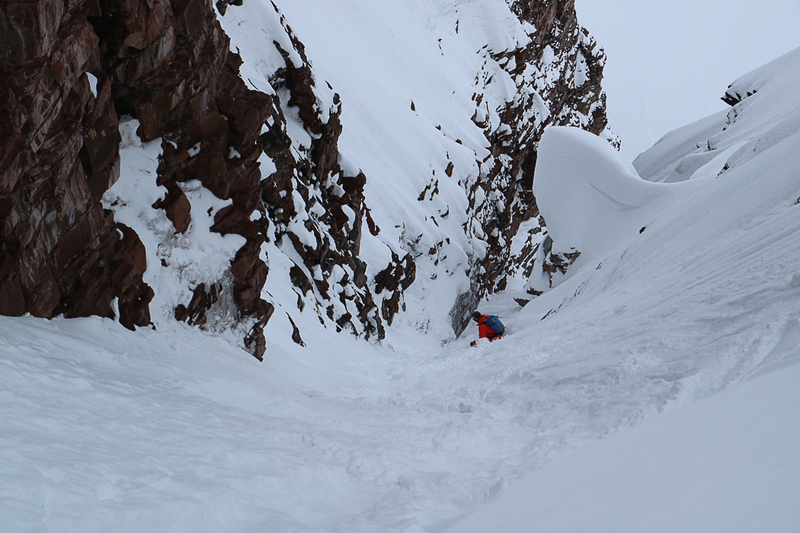 It wasn’t until we were under the apron of the couloir that we weren’t still convinced that the couloir was near vertical. On the apron we managed to skin for another couple hundred vertical before trading in our skins for crampons and ski pole for ice axe. How many switchbacks can we put in? 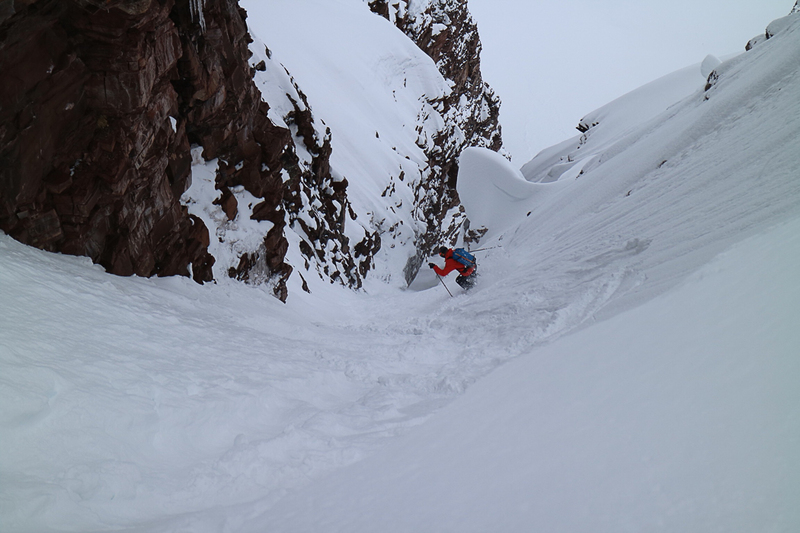 Approaching the apron, we would skin part way up the apron before switching to crampons. The booting started out relatively manageable and as we hit the left turn into the slot it got progressively deeper for the rest of the climb. 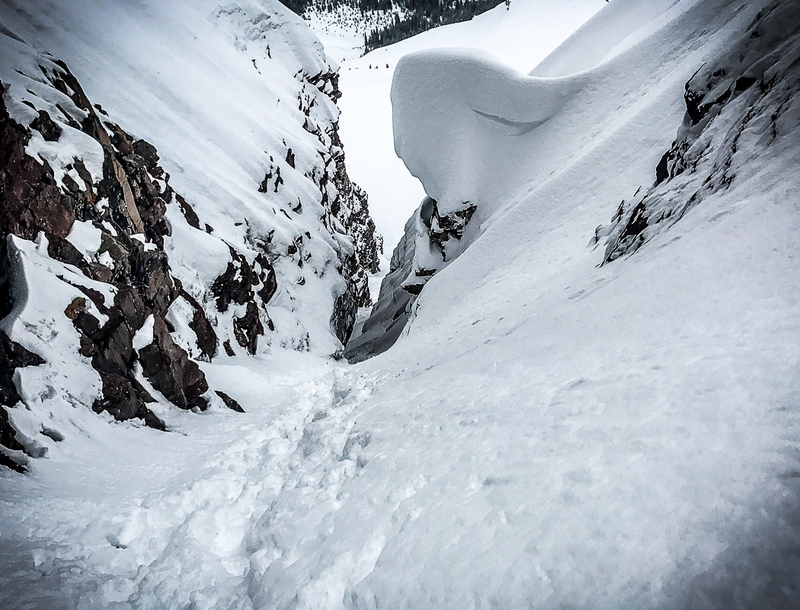 The lower half of the chute below the pinch is relatively wide but does have an interesting double fall line that feels like it wants to constantly push you into the rising rock wall. As we increase in elevation, the pitch follows suit, and so does our awareness of how spicy this is getting. 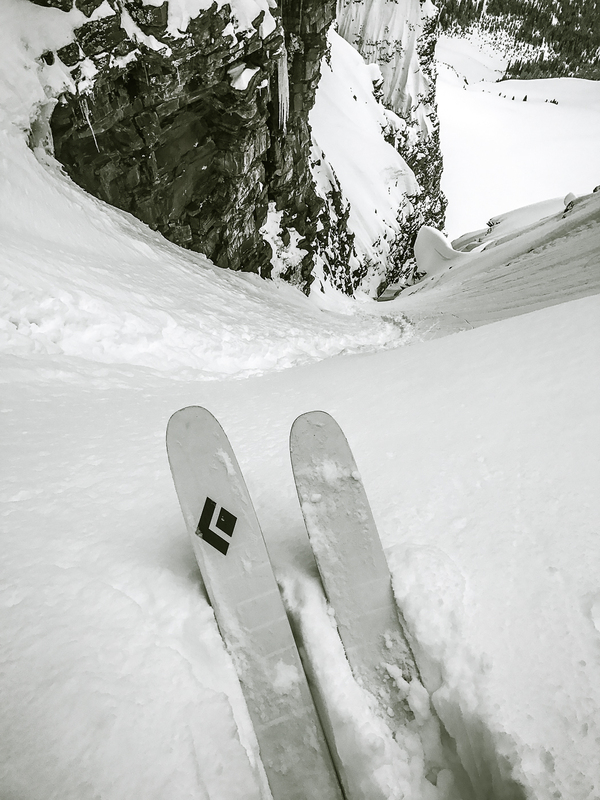 The double fall line combined with the narrow width made for exciting conditions. 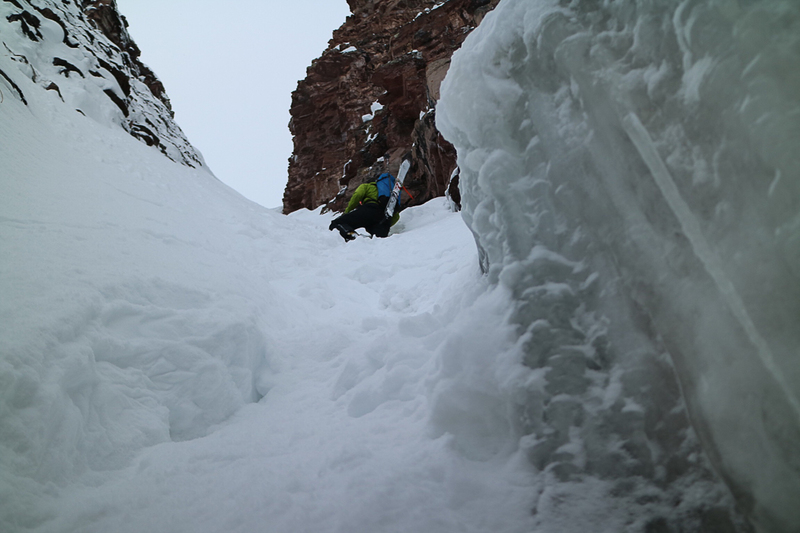 After some trenching up in deep snow we hit what I’ll call the double choke. I’ve never been through a feature quite like this before. 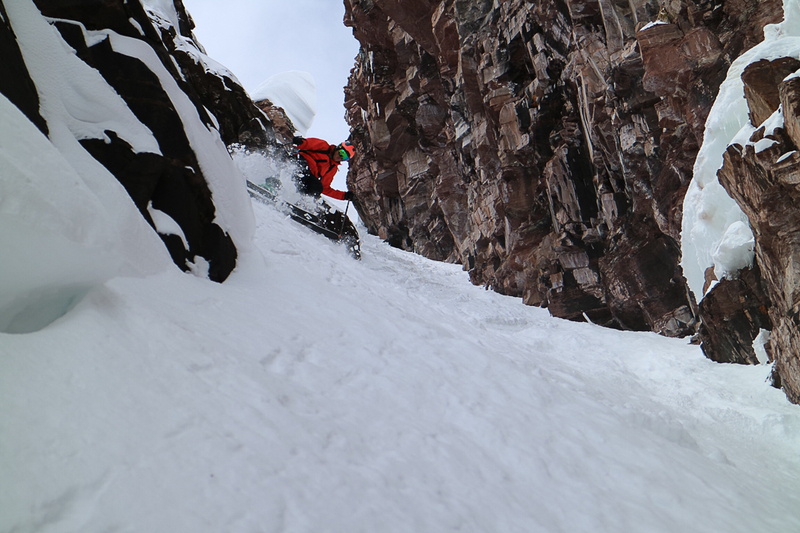 The lower choke was just a protruding rock band that was easily bypassed on the way up. 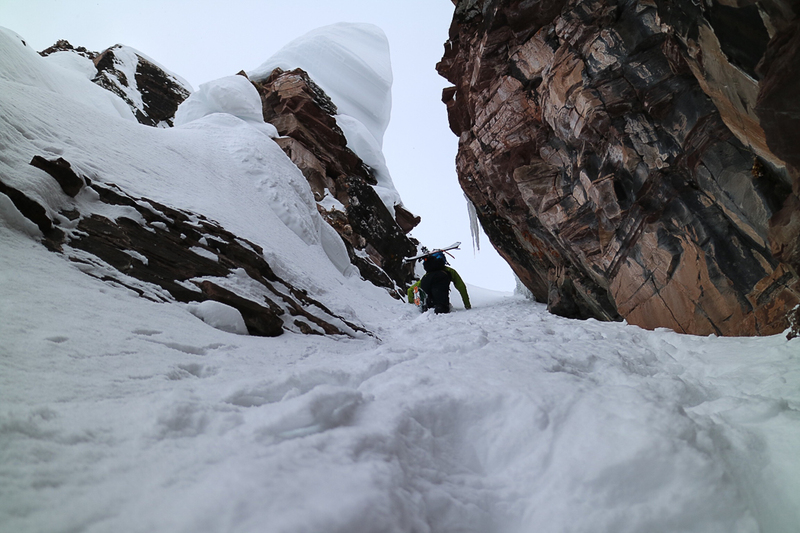 As we pass the second choke it’s interesting to see icicles hanging in our way and the rock leaning out over the snow, making us duck in order to get our skis underneath it. Passing the choke we are near the top of the couloir, but the pitch has increased to a rowdy level. We continue to swim and trench our way up the remaining vertical. By the time we reach the top, the pitch is exceeding 55 degrees. 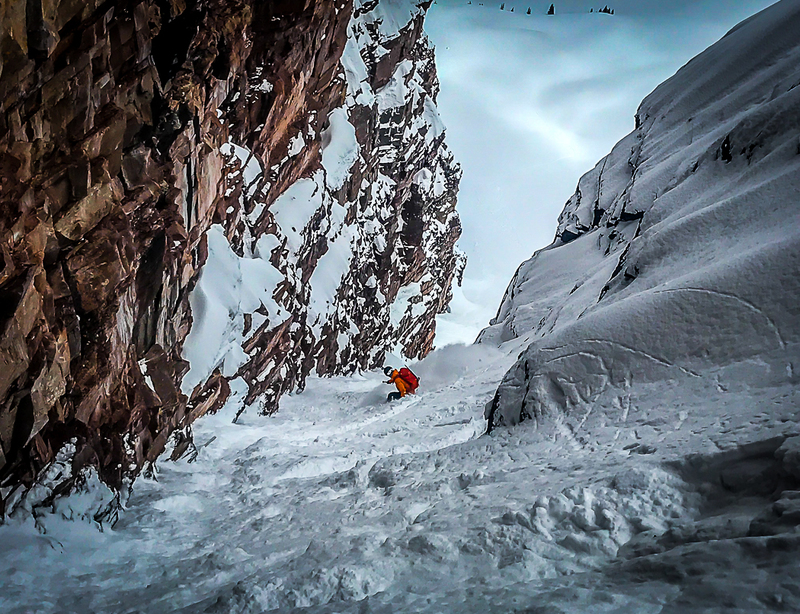 Me breaking trail through the choke with a rather intimidating pillow hanging over my head. Anton coming through the choke. Gonna be tight. The ice just adds to the aesthetics. 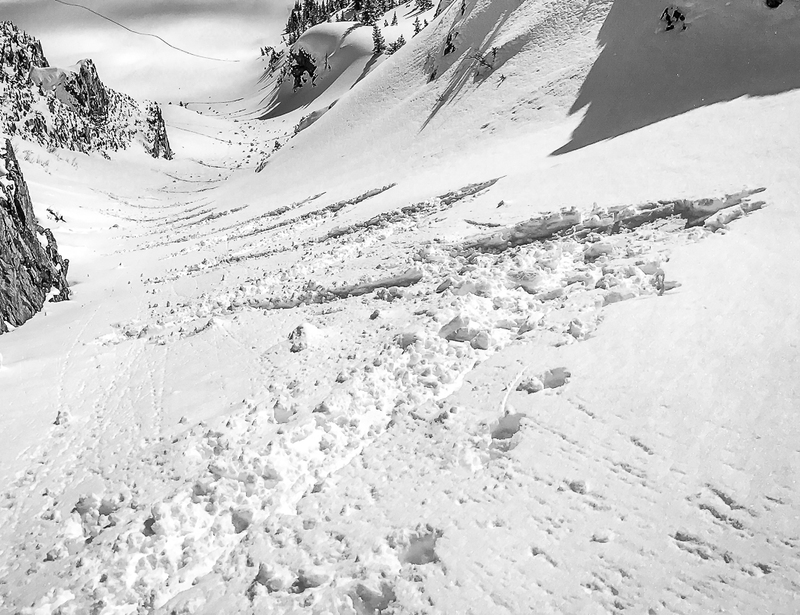 After a brief moment at the top of the couloir we talk about going to the summit. Anton had little interest at all, but I felt like if it wasn’t too spicy of a climb I’d like to try. 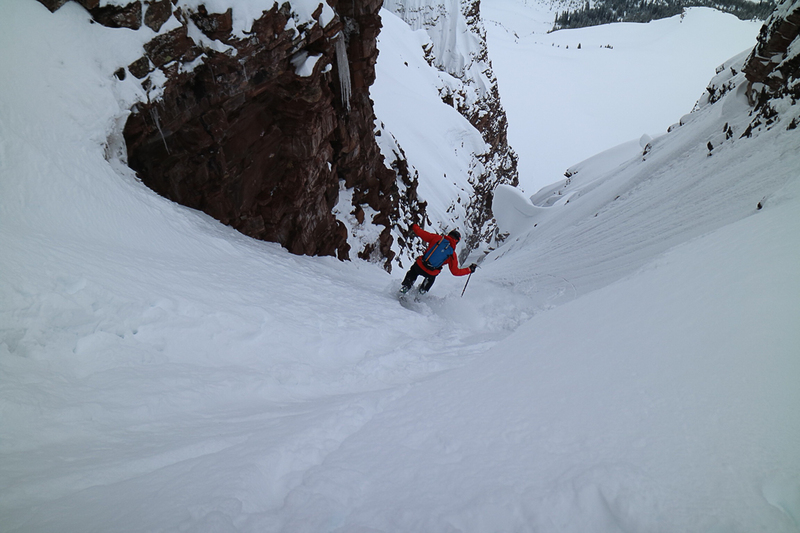 I climbed around the corner to the west and found an even skinnier couloir that led to the summit ridge. It wouldn’t be skiable, but it was better than trying to fight my way through potentially dangerous windslab to find my way around the back on the way up. 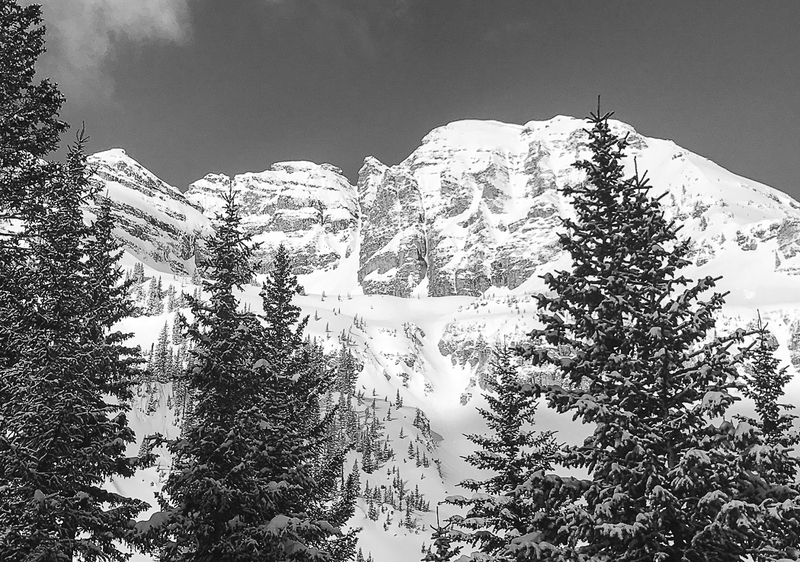 After a couple of stemmy moves to avoid punchy snow I found myself just steps away from one of the more aesthetic summits I’ve been to in Colorado. I took a second to enjoy it, take some photos and transition to skis. 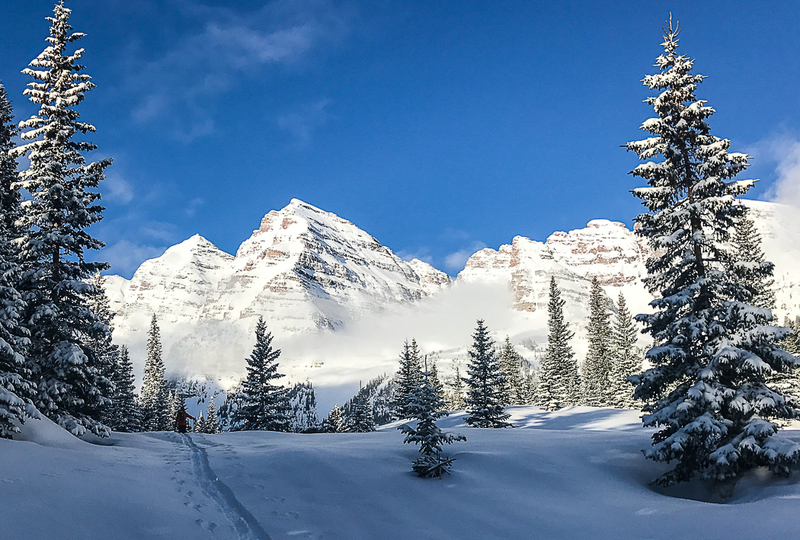 Quite the perspective on the Maroon Bells. 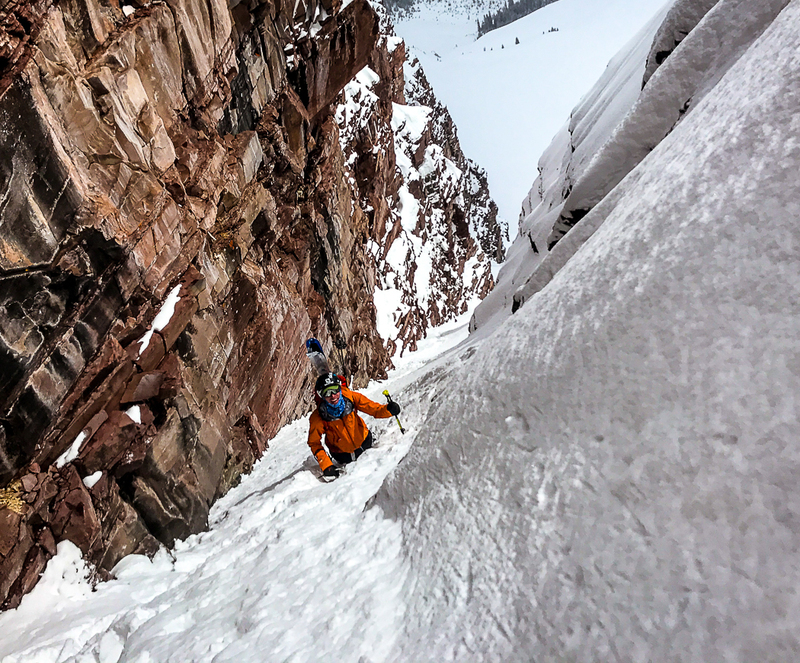 The east face direct didn’t really look like an option for getting back to the couloir, so I went to explore the west and with a short section of billy goating I found myself on solid snow wrapping around the northwest side of the peak back to my couloir. 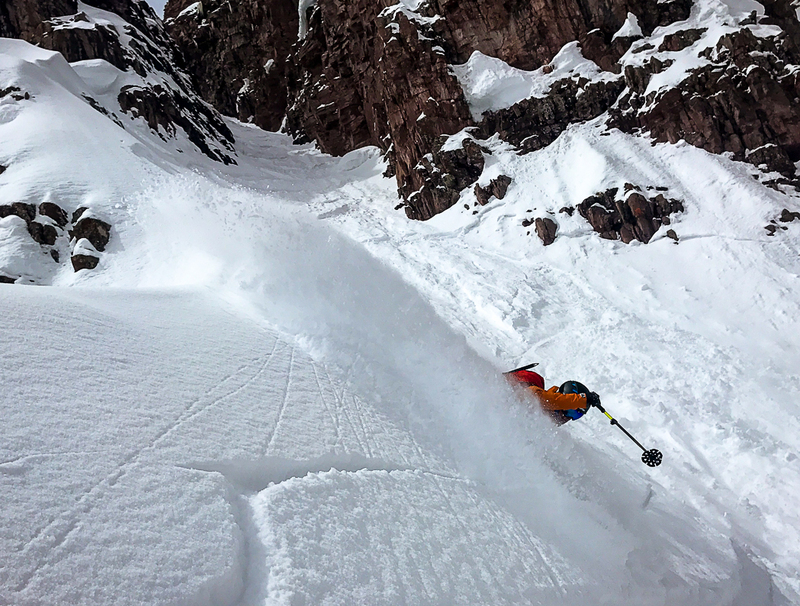 I stayed high trying to be on top of the windslab that had formed on that aspect, and as expected it sloughed off in massive quantities picking up steam as it headed down the west couloir into lost Bermuda Basin. 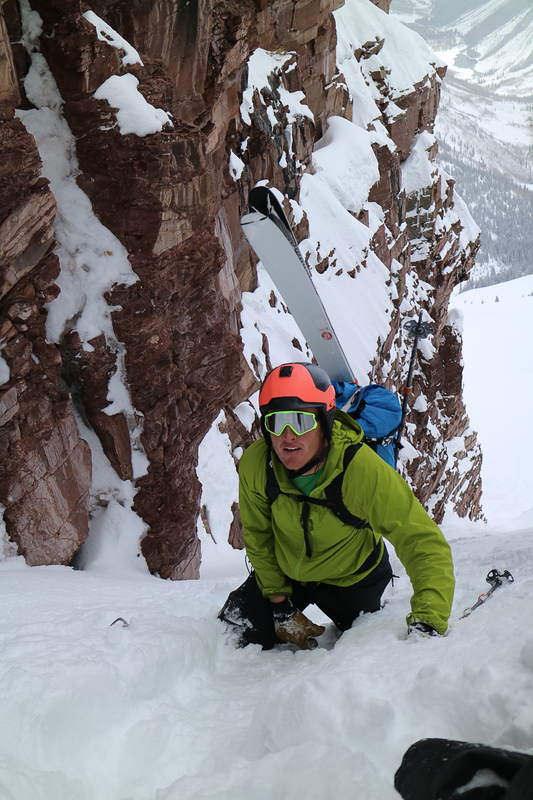 Reunited at the top of the couloir and readying for the business it was time to focus. 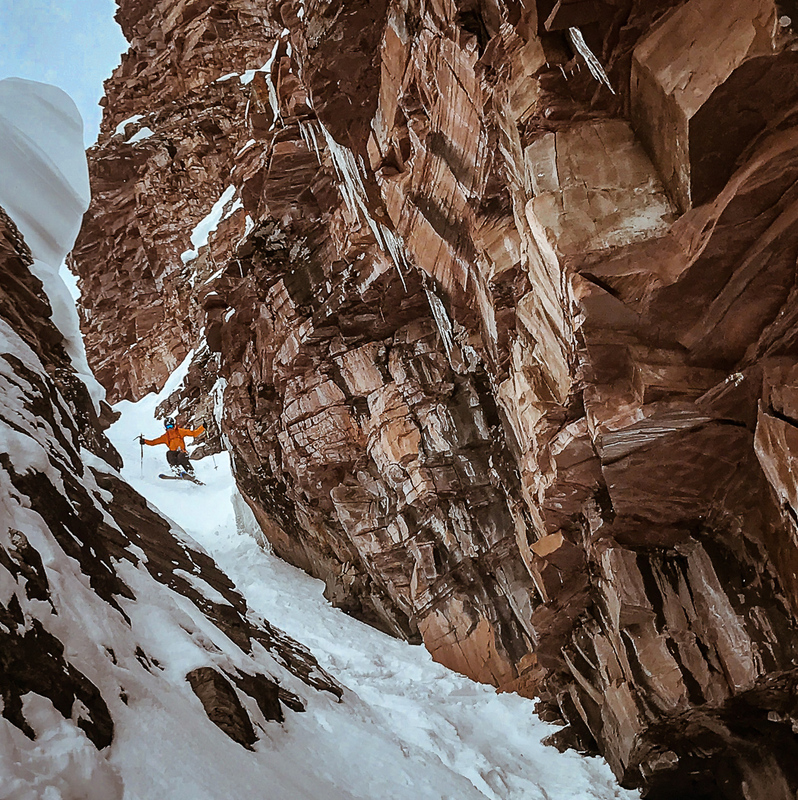 I stood at the top with my ski tips hanging over the edge for a couple minutes while Anton finished getting ready. 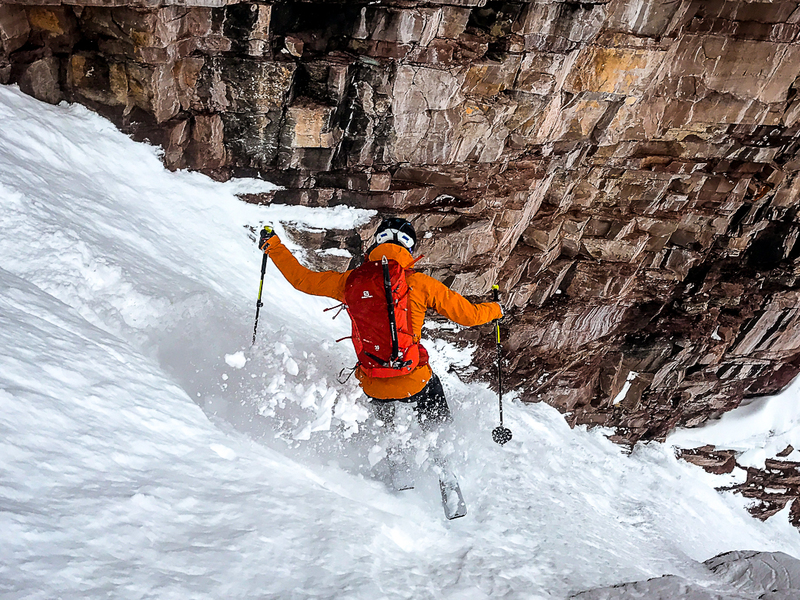 Puckered is a word you hear a lot in the ski world. Well this is as puckered as I’ve been all year. It’s been a good year for skiing pow and skiing windboard up high in March, but this thing was between 55-60 degrees and had the potential to produce some serious slough. If we hadn’t climbed this baby ahead of time I’m not sure how willing I’d be to drop in given this view. First turn… jump turn to a stop…whoa that is steep….lots of slough…couple more turns…watch as the snow falls away under my skis…deep breath….time to get to it. 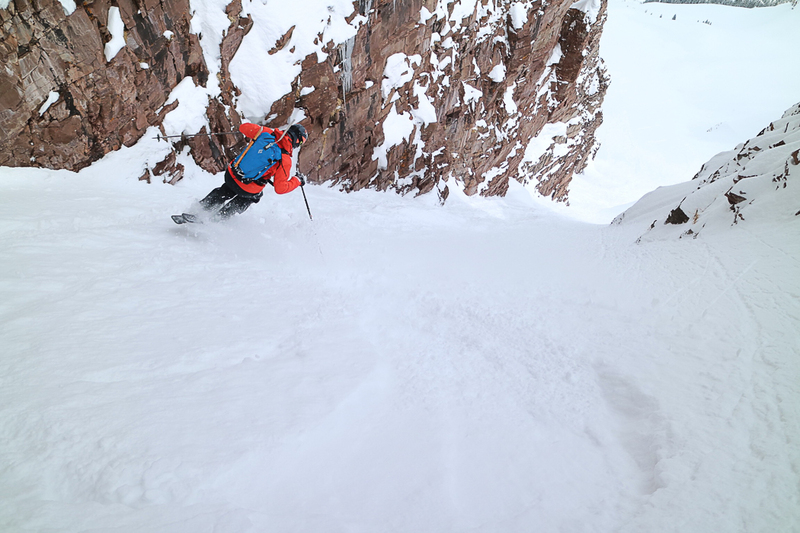 A couple dozen jump turns brought me down to the double choke and some vary awkward finagling to get my skis through. Wiggle past the rocks…straightline… slam on the brakes…repeat. 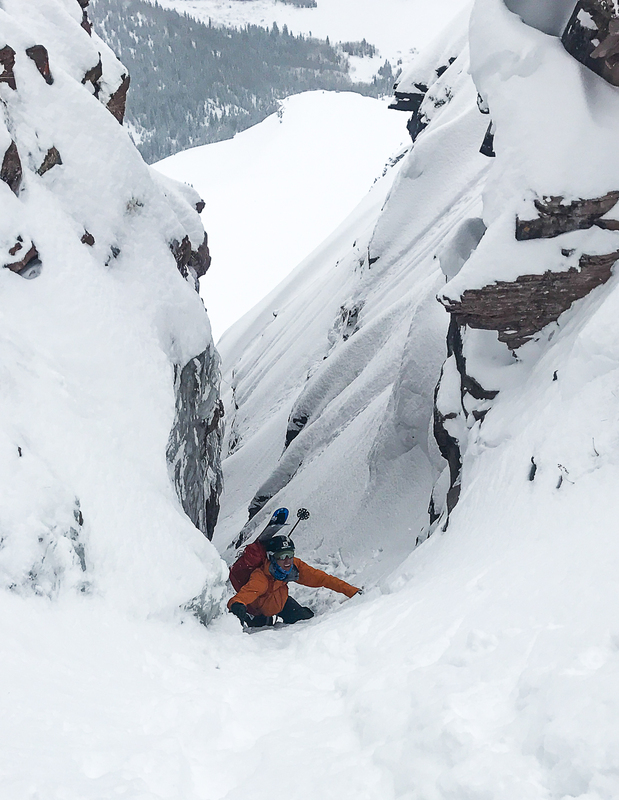 Through the choke and out of Anton’s fall line, it’s his turn. 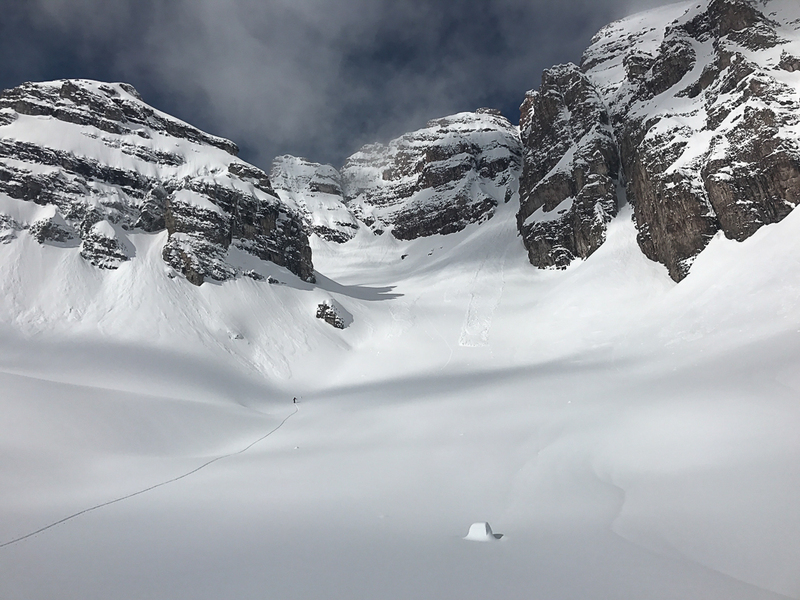 Both of us past the choke we have a bit of weight off of the situation and the skiing is just fun steep soft skiing all the way out to the apron albeit with a lot of jumpturns and slough management. Anton making that last Jumpturn before slipping through the pinch. Just peeking around the corner. Taking it towards the bottom. Pocket of blower near the apron. Me getting a few bonus turns in as Pyramid sets the background. 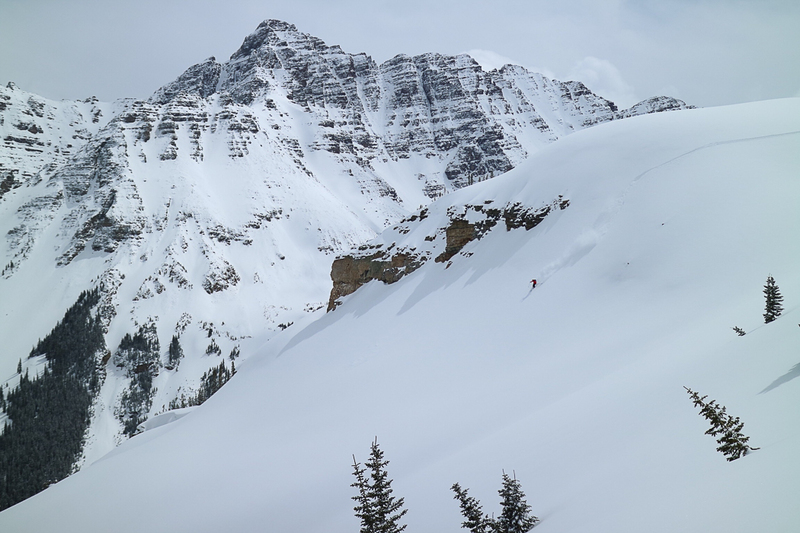 We skied powder all the way back to treeline, constantly looking back at what only appears to be a vertical chute of snow to the summit of a rarely climbed peak, and even more rarely skied peak. 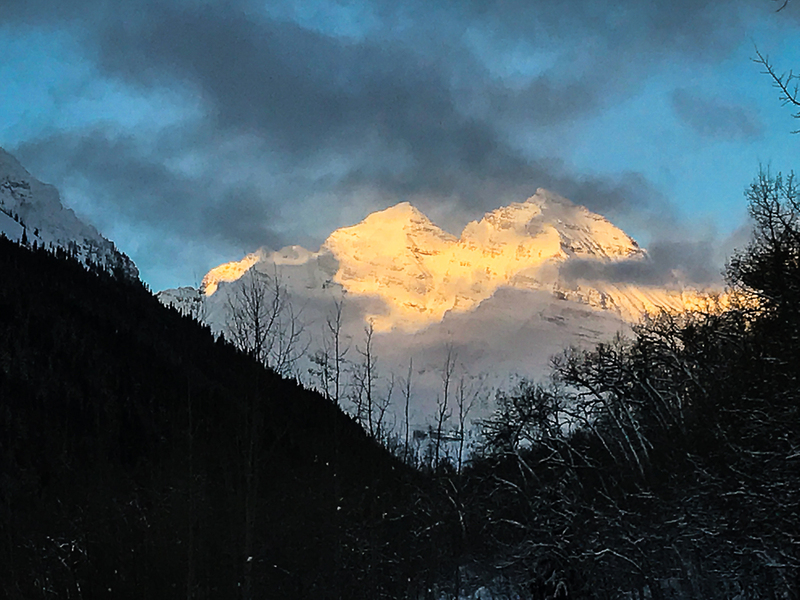 As we got back to the trailhead and the snowmobiles we turned around to see the Maroon bells and the Sleeping Sexton all but disappearing into a dense layer of clouds and snow. Our tracks would be erased before we knew it, which is just fine by me; the canvas is clean and ready for someone else’s interpretation.